Specializing in goal-based wealth and tax management. Markow Financial Group, Inc. is an independent financial firm that specializes in providing customized solutions tailored to your individual goals and needs. In a profession based on objective advice, true independence offers many choices intended to benefit you. Because Markow Financial Group, Inc. is an independent business we have the freedom to structure our business in a manner that best serves our clients. We take pride that our company is anchored around the principle of truly caring about making your dreams a reality. Our experience, knowledge, and objectivity enable us to help you clarify your specific goals to develop a financial road map for your future. We listen to your needs and partner with you to develop a financial plan that reflects your personal ambitions. We expect your life to change and will continually monitor and revise your plan to ensure it is aligned with your stated goals. At Markow Financial Group, Inc. we believe in following a disciplined, long-term approach to investing. We implement comprehensive strategies best suited to your unique needs and deliver market and account information in a way that is easy to understand. Understanding the various insurance policies and finding the most suitable policy for our clients is one of the most important services we provide. Adequate planning for death, disability, and long-term care is essential. Whether your needs are for individual or family coverage, we explain your choices and help you personalize a plan that best fits your situation. One of the most confusing elements today is understanding how our tax system impacts investing and planning. Knowing how an investment is taxed is crucial to knowing if the investment is right for you. At Markow Financial Group, Inc. we take the mystery out of tax planning by providing comprehensive solutions customized to fit your evolving financial needs. 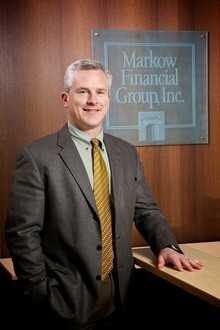 Please explore our site and learn more about Markow Financial Group, Inc. and the services we offer. Also, you will find a wealth of information in the form of articles, newsletters, calculators and a financial library.